National Women’s History Month traces its beginnings to 1978, when the Sonoma County, California’s Commission on the Status of Women’s Education Task Force declared a “Women’s History Week” celebration and scheduled the event to coincide with “International Women’s Day,” March 8th. The idea took root so quickly that by February 1980, President Jimmy Carter issued a Presidential Proclamation designating the week of March 8, 1980 as “National Women’s History Week.” By 1987, Congress designated March as National Women’s History Month in perpetuity. The first wave of feminism occurred in the late 1800s and early 1900s, with the Seneca Falls, New York Convention in 1848 the rallying event, which launched the modern-day US women’s movement. The second wave of feminism ran from the 1960s to the 1990s, beginning with protests of the Miss American Pageant in the late 1960s. By 1978, the second wave of feminism in the United States was already going full throttle and had moved away from a “middle-class white women’s movement” to one that included women of color and women from developing nations. The third wave of feminism began in the 1990s informed by post-modern and post-colonial thinking. While we often know the names of the heroines of the modern-day women’s movement, Elizabeth Cady Stanton, Sojourner Truth, Gloria Steinem and Bella Abzug, I’d like to put forward a new name into the mix, one whose accomplishments helped propel women forward during World War II, at a time when the ideal of Rosie the Riveter is known to us, but the name of Oveta Culp Hobby has yet to be writ large in the books of women’s history. The White House was ill-prepared to respond to this sea of inquiry, and started the Women’s Interest Section of the War Department’s Bureau of Public Relations to answer these letters. Oveta Culp Hobby, who, with her husband, the former Governor Will Hobby of Texas, was in Washington, D.C. at this time. The Hobbys owned and ran The Houston Post in addition to other local media interests. They were attending a meeting of the Federal Communications Commission regarding one of their Houston radio stations. General Surles met Oveta and asked her to run the Women’s Interest Section for the Army. Although she didn’t want to leave her husband and two small children in Houston, Oveta agreed to take the position in D.C. for six months for the sum of one dollar a year, as she and her husband both agreed it was her patriotic duty for the war effort. As World War II escalated and the U.S. joined in, it soon became clear to the White House that even with all the men drafted into the military services, there was still a shortage of military personnel to handle the huge demand fighting the war on multiple fronts was placing on the country. General Surles turned again to Oveta and asked her to draw up a plan for a women’s army to help supplement the ongoing military effort. Oveta agreed and after an intensive study of the British and French women’s armies, prepared a plan for a Women’s Army Auxiliary Corps (WAAC) that would avoid making some of the mistakes the European women’s armies made. Oveta drew up a plan and testified in front of Congress showing how women serving it the WAAC could release men for frontline duty. When WWII ended, these almost 100,000 women returned to civilian life. But their experiences in the Army, as independent people performing vital jobs for their country, stayed with them. The leadership skills, occupational skills and sense of freedom the women gained during their stint in the military made it hard for them to rejoin the mundane housewife roles they were expected to return to as they rejoined and re-engaged in their former lives. Although Oveta Culp Hobby herself abhorred the term “feminist” and refused to call herself one or adopt the label, if the definition of feminism means “equal pay for equal work,” then certainly Oveta was a front runner in this movement. 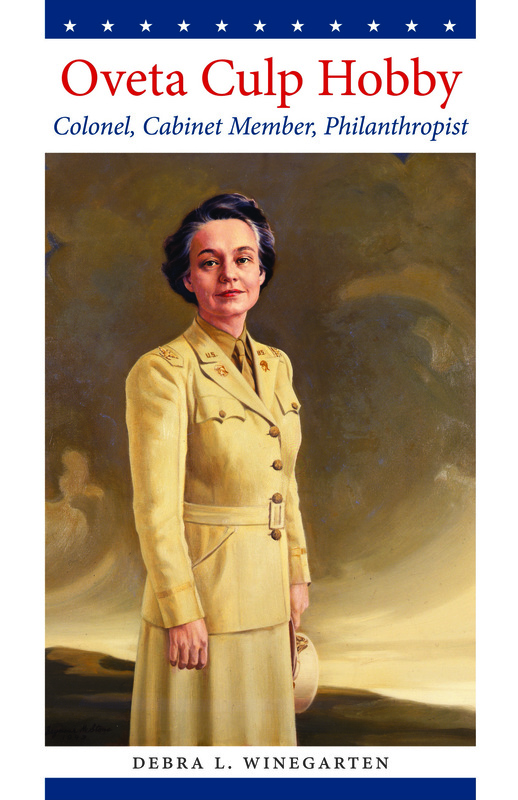 Not only did she advocate for equal opportunities for women during a time when women were still viewed largely as second-class citizens, she also insisted that even though the Women’s Army Corps units were segregated by race, that the African-American women’s units would have African-American women as their officers, providing equal training opportunities to women of all colors. Thus, Oveta’s vision and extraordinary insights made her one of the unsung heroines of the second wave of feminism and our present-day women’s movement. To find out more about the accomplishments of this woman from Killeen, Texas who ended up being the second woman in the US appointed to a Cabinet-level position, thanks to President Eisenhower upon whom she made a lasting impression while she was a Colonel, read my new book, “Oveta Culp Hobby: Colonel, Cabinet Member, and Philanthropist,” due out this month from UT Press. Texas: Shoal Creek Publishers, 1980. Pacific University. Vol. 41, No. 2, Fall 2008. Shire, Al, ed. Oveta Culp Hobby. Houston, Texas: Western Lithograph, 1997. Philanthropist. The University of Texas Press, Austin, Texas, 2014. Lasher and Bentley, Texas Women, 76. Shire, Oveta Culp Hobby, 58.